Thomas J. Divis, 95 of Abie, died Friday, August 3, 2018 at david place in David City. 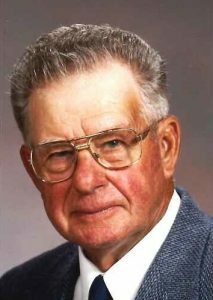 Tuesday, August 7, 2018 10:00 a.m.
Visitation Monday, 5:30 p.m. to 7:00 p.m.
Tom Divis, 95, of Abie is now enjoying his reward in Heaven after a life of hard work, farming, woodworking and raising a family. He passed away on August 3, 2018, at David Place in David City, Ne. A quiet man, he loved his family deeply and enjoyed nothing better than listening to polka music and dancing. Tom was born on March 5, 1923, to Albert and Ludmilla (Kudlacek) Divis and was the oldest of seven children. He enlisted in the Army and was stationed in Japan as a mechanic. Upon his return he met his future wife, Martha (Bartunek). They were married on December 27, 1951 and blessed with five children. He was preceded in death by his parents and wife Martha on August 13, 2008. Tom will be greatly missed by his children: Alton (Marjorie) Divis ofColumbus, JoAnn (Larry) Hlavac of Bruno, Caroline (Tom) Forstrom of Lincoln, Doris (Doug) Redler of David city, and Lori Divis of David City. Grandchildren and families: Scott, Billie Jo, Seth and Riah Hlavac; Bryan, Lisa, Zach, Jake and Josh Siebert, Cameron and Ava Hlavac; Craig Divis, Lynette, Jeremiah, Jayden and Myah Bollig, Colby Redler, Christy, Ben, Peyton and Bo Aschoff, Creighton Redler , Jason Forstrom and Heidi, Jeremy, Kelsi, Kylie and Hallie McDonald.